Over recent years bushcraft has grown in the nation’s consciousness and has devotees from the armchair enthusiast to iconic educators who are masters of their craft. The historical record shows that there have always been bushcrafters, they were just called different names: woodland managers, mountain men, voyageurs and of course the original paleolithic hunter gatherers. But when and where did the new bushcraft resurgence and insatiable hunger for outdoor living skills originate? In the 1980’s the developed world was cruising headlong into the computer age, living by mantra’s such as ‘lunch is for wimps’ while the corporate ladder offered the promise of untold riches and promotional carrot ‘if you stay on after work to complete this report for me’. In our oil driven economies the prospect of the black gold riches drying up was too far off to really worry about, habitat destruction was a problem limited to the Amazon basin and the reality of climate change was still mainly academic. Into this crashed Paul Hogan starring as the larger than life character Crocodile Dundee. Amongst the outrageous plot lines were some gems of the subject we now know as bushcraft. Who could forget the scene where Mick Dundee calls on his aboriginal friends for help using the ‘bush telegraph’ (an item properly known as a bull roarer). Or, when he introduces his girlfriend to the wilderness known as Belongamick (Mick’s Place). The film also introduced us, albeit with clumsy Hollywood simplicity, to the idea of respect for first nations people and their knowledge. In Britain, it wasn’t until Ray Mears first appeared on our TV screens that bushcraft came of age. His down to earth enthusiasm, kinship with the last remaining hunter gatherers (that episode with the Hadza still gets me every time) and deep respect for ‘the nature’ was infectious. My bushcraft journey had begun. For my Mountain Leader (ML) assessment I invested a lot of time into researching the subject of re-wilding for a presentation and producing laminated crib cards of upland plants. One of the assessors liked them so much, he used copies to help with his revision for the International Mountain Leader (IML) award. When journeying, I began to introduce elements of bushcraft such as experimenting with baking bannock and stockman’s bread on an open fire. On my navigation courses I discussed where to look for natural clues which would complement conventional map and compass skills. Each time expeditions took me back to my beloved East Africa, I made time to learn something new: animal behaviour, ecosystem issues or a few extra words of Swahili. A thirst for more in-depth bushcraft knowledge and the ability to practice these skills with greater proficiency led me to sign up with the Woodcraft School on their advanced course. The course is unique in that it is accredited by the Institute of Outdoor Learning. It is divided into a five day teaching block, followed by a three week period for self-study and practice, then concludes with three days of assessment (although guided learning carries on right through the whole process). The Woodcraft School is situated in a private ancient woodland in the South Downs National Park. It is run by John Rhyder, a foremost expert in forest management and bushcraft skills. He is assisted by instructors who have graduated through the Woodcraft School year long diploma course, all highly skilled and able to share knowledge in their own personal style. The course began with safe use of the mora knife, the most commonly used bushcraft tool, developing the range of cuts over the week from shaping simple log splitting wedges through to carving items such as spoons and bowls. Then there was fire by friction, for many of the students the holy grail of bushcraft. We used the bow drill method. What came as a surprise to me was the amount of fettling and tweaking needed, combined with good technique needed to turn wood into hot black powder, accumulating enough for it to glow as a dull red ember. Then there was the delicate transfer of this hard won coal into a straw bundle, followed by long gentle breaths and wafting, patiently coaxing the smoke into flame. It took me several attempts, but the satisfaction of eventually seeing the dancing lumiere at the ends of my fingers felt like alchemy. The foundation of bushcraft is knowledge of the natural world. On a woodland walk, John showed us plant and tree species, taking time to discuss their multitude of uses: bark for tinder, bow drill materials, medicinal remedies and good eating. Pendulous sedge seeds bound together with egg white and dry fried was surprisingly tasty, as was burdock root roasted in fire embers. Importantly, we also learnt plants with toxic effects. Like with our paleolithic ancestors, bushcraft knowledge is carried in the mind, meaning craft skills are essential. I wanted to produce something personal to me, it could only be one thing, the bull roarer. I split down a piece of western red cedar. Shaping the shingle into an oval and tapering the cross section into an aerofoil. Sanding brought out the lovely wide grain of the wood, but it was blank, it needed a something extra. 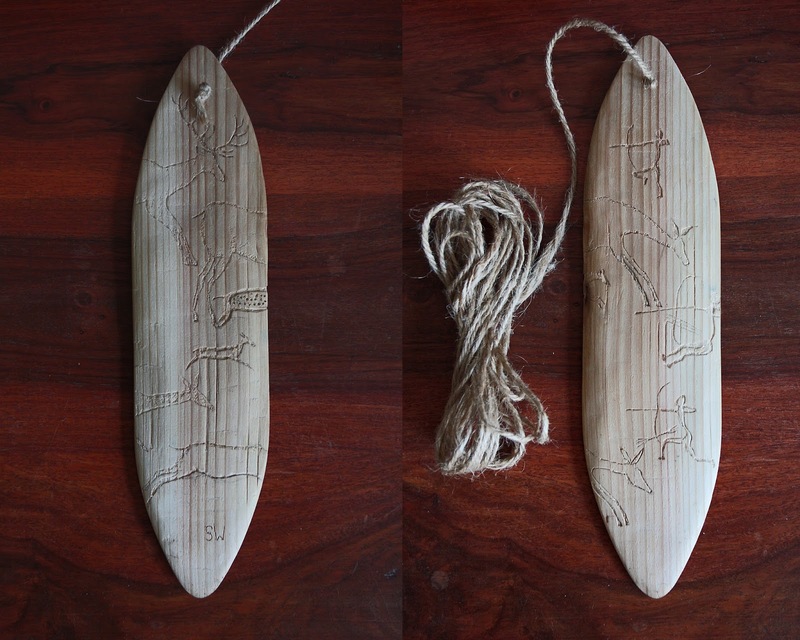 The story I etched into my bullroarer was inspired by San bushmen cave paintings I had seen in Namibia. I also wanted to express the sense of connection the hunters had with the land, a connection which stretches back to the unwritten sub-conscious memory of the Mesolithic. I attached a long length of three-ply cord, twisted it up and spun the bull roarer, whipping it round to make it whirr and sing in oscillations. Returning three weeks later, I felt a certain amount of nerves. It had been a good few years since I had sat any form of written exam. John and his team reviewed every subject the day before each assessment. I found it really helped to be in the context of the woodland. At one point I chatted with John about the assessments and we both agreed they are not designed to be stressful provided the candidate has spent time to practice and revise during the consolidation period. If no additional work had been done it would be a struggle. Results were given soon after each test and my confidence grew once I had successfully negotiated the trees, plants and their uses with maximum points. Thankfully, I made fire by friction at the first attempt and my other fire making methods (solar reflector, fire steel and chemical reaction) all worked well. The water safety, hypothermia and hyperthermia papers were all easier for me with my background in expeditioning and mountain leadership. Finally there came the tracking test. This had become a favourite subject. I sensed the spirituality in following sign and telling the story of the animal which left it. John had marked various sign on a trail with a series of flags. We had to identify the animal which left the sign and explain why it was there. Apart from a minor wobble where I managed to convince myself that rabbit was actually muntjac (eh, a lop eared furry deer…I know!) I got through the pass mark of 80%. All too soon it was time to break camp. 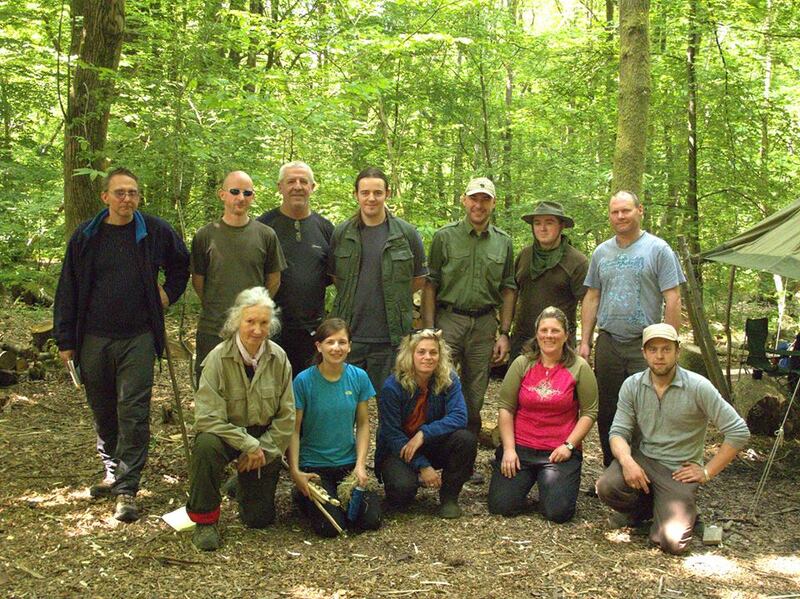 It had been an excellent course, characterised by laughter with fellow bushcrafters and the sharing of knowledge which had true value. I’m now looking forwards to incorporating more bushcraft activities into Ranger Expeditions courses, enabling clients to enjoy a deeper understanding of the environment in which they are journeying and maybe sense the traditions of those mesolithic hunter gatherers who have gone before. What’s great about bushcraft is that there is always more amazing things to see, skills to learn and experiences to enhance understanding. In many ways the journey has just begun.